One of my favorite easy brunches is at Suzanne Goin and Caroline Styne’s A|O|C, located on prime 3rd Street real estate just a few blocks away from the Original Farmers Market. I’ve pretty much eaten my way through their entire brunch menu and I can with confidence tell you that no dish will disappoint. 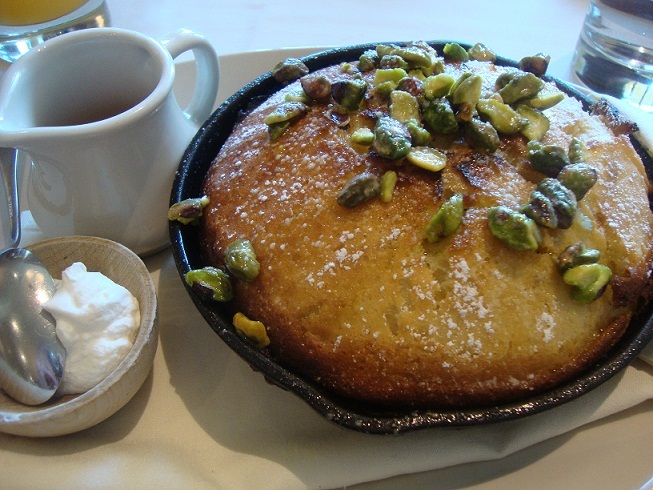 Particular favorites of mine include Javier’s Chilequiles, their wood-oven baked blueberry pancake with candied Meyer lemon and pistachios (photo above), and their pastry plate featuring goodies like flaky croissants and breads from Tavern. A couple more substantial dishes that are worth the taste include their duck confit and wild mushroom hash served with a beautifully poached egg. They’ve also got the traditional steak and eggs which features a tender hangar steak, eggs any way, over an artichoke hash with black olive hollandaise. Moderately priced,you can get away with a not-so expensive brunch experience here…that is, unless you can’t resist their stellar wine list and their fresh farm-to-table bellinis (the tangerine and basil being a worthy experience unto itself). It also doesn’t hurt that the restaurant space itself is fairly beautiful. A|O|C is located at 8022 W. 3rd Street, Los Angeles.